We've come up with a few reasons that you might want to give us a try. Some reasons are important, some are informative, and some are fun. And we're proud of every one of them. If you're a long-time customer, tell us what we missed. If you're considering Lowell's for the first time, read through the list and decide whether we're right for you. And, as always, please share ways you think we can be even better. The best way to choose your mechanic is to ask other people about their mechanic. Who treats them with respect, integrity, and generosity? In other words, are they happy with their mechanic? At Lowell's, our proudest achievement is our long trail of happy customers. We know that when our customers are happy, we're doing our job right! See what our customers have to say, then decide if Lowell's is right for your Toyota, Lexus, or Scion! Lowell's can complete most repairs (even major ones) in the same day that you drop off your vehicle. Our fast, reliable service helps you get back into your car faster. Because we use the best parts and have the best technicians, we stand behind our work. You preserve your factory warranty. You can have your vehicle serviced at Lowell's and maintain your Toyota or Lexus factory warranty. Many people wrongly believe that they must have their new car serviced at the dealer to maintain their warranty. And because their service departments are their biggest source of profits, dealers don't discourage that misperception. As a consumer, you should know that you are legally entitled to service your car at the repair shop of your choice - and the manufacturer must honor that service for your vehicle warranty. We provide all manufacturer-recommended service. Lowell's provides all manufacturer-recommended maintenance services for your Toyota or Lexus. This means that you can have Lowell's perform your regular maintenance items (oil changes, fluid flushes, brakes, etc.) in addition to having us do major repairs. 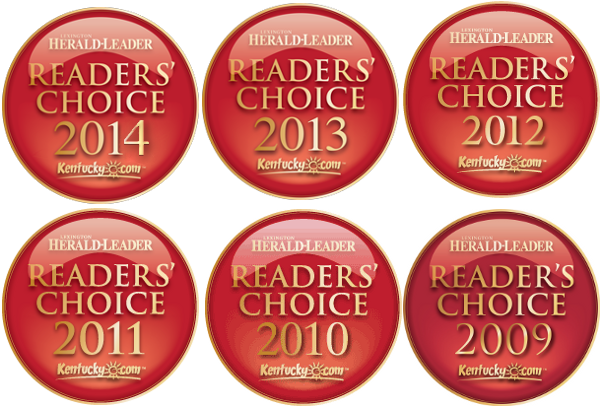 Lowell's has won more awards for our service than any other Lexington mechanic. 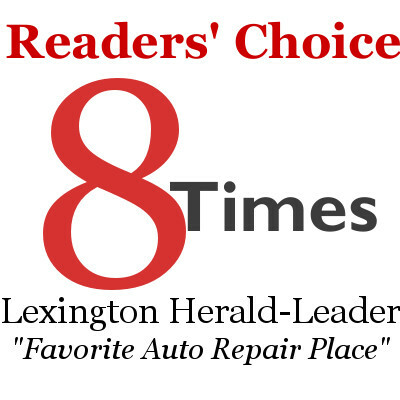 Lexington Herald-Leader readers have selected Lowell's as their Favorite Auto Repair Shop 8 times in their annual Readers' Choice Awards, including each of the last six years. 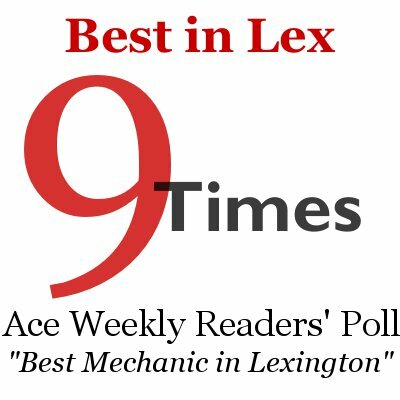 Lowell's has also been chosen Best Mechanic 9 times by Ace Weekly readers in Ace's Best of Lex poll. Actually, Ace readers have chosen Lowell's as Best Mechanic, Best Honest Mechanic, and Best Fear-Free Mechanic over the years. At Lowell's, we hope to build a long-term relationship with our customers. We believe that treating customers with respect, integrity, and generosity is the surest way to build our business for the long term. It is a formula which has worked extremely well for Lowell's for over 30 years. Over the years, we've found that there is simply no substitute for genuine Toyota parts on critical categories of parts - such as brake pads, oil filters, antifreeze, and ignition coils. Lowell's offers the best combination of quality and affordability on our parts, which allows us to stand behind our exceptional 3-year warranty at a reasonable price. We're very good at fixing cars. Occasionally, however, we'll mess up: We might fix the wrong noise, for example, or we might miss the real source of the running problem. We're always working to eliminate mistakes like these, but we believe we should make it right when mistakes do happen. This could mean fixing the real problem at no charge. Or, we might refund the cost of the original service. Whenever we make mistakes at Lowell's, we always try to make it right. Lowell's offers monthly specials on our website. Just print out the coupon, and bring it with you to your next service. You can check your maintenance history online. We know it can be a hassle to keep up with your vehicle records. Now you don't have to. You can check your vehicle history through our website. We'll note the date and mileage when you had each major service item, as well as anything else of note. You can make appointments online. You can make your next appointment with Lowell's through our website. Lowell's has been serving central Kentucky since 1979. While longevity doesn't always equate to great service, we strongly believe that we've thrived for over 30 years because we've truly cared for our customers and their vehicles. If your tires lose pressure or your car loses oil between services, you can bring it into Lowell's to have us top off your oil, fluids, or air at no charge. We offer competitive prices for most services, and our prices for many services will be the lowest you can find. We keep your vehicle running well. 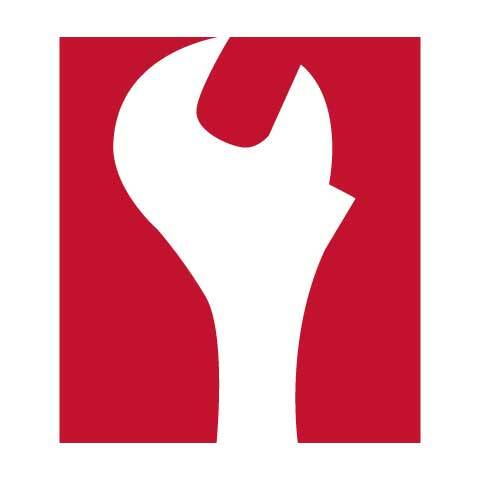 By keeping up with regular maintenance items on your Toyota or Lexus, we can help you avoid more costly repairs later. We can take you to work. Or home. We know that you have plenty to do in addition to fixing your car. Lowell's offers several easy - and free! - ways for you to get back to your normal routine. Let us drive you back home or back to work in our free shuttle. Or, you can take yourself. If you have a lot of places to go while having your car serviced, you might consider driving one of our free loaner vehicles to get around. If you're feeling particularly energetic while we work on your car, consider using one of our unique loaner bicycles to get around. (We'll even furnish a helmet for you!). You can relax in our lobby. If you've got some time, you can relax in our clean and comfortable lobby while we service your car. While in our lobby, be sure to visit our 5-cent Coca-Cola machine. We're pretty sure you haven't seen prices like ours for Cokes in over 50 years. Please try out some of our uncommonly good gourmet chocolates or caramels whenever you visit our lobby. They're delicious! You can take our magazines home. We always have an eclectic collection of recent magazines in our lobby for you to read. If you're not quite done with that great article when your car is ready, please take a magazine with you. They're free to a good home! You can connect while you wait. You can connect to the internet with your own device using our complimentary wireless access, which is available throughout our lobby. You can play / explore / connect with our iPad. You can use our free loaner iPad to surf the web, check the news, or play Angry Birds in Space while you wait for your service. You can connect with our workstation. You can use the computer in our lobby to connect to your digital life. We've got plenty of free parking. We know that it can be a pain to park when you bring your car downtown. Even though we are located in the heart of downtown Lexington, we have plenty of free parking for our customers. Drop off your car at our front door. Most of the time, you can drop off your vehicle right at our front door on Mechanic Street. This is especially convenient in nasty weather. We'll tell you what your Toyota or Lexus really needs. We'll identify what needs your attention now, and what can wait for later. And we'll never try to scare you or trick you into making a service decision. We know it's your decision. If you choose not to approve a service item, that's fine with us. If you don't have enough time for service right now, that's fine, too. It's your car; we let you decide. We look out for our customers. At Lowell's, we try to anticipate what your vehicle needs. As part of our Courtesy Check program, we'll inspect your vehicle (including belts, hoses, and fluids) at every visit and identify what might need your attention. We understand that all of the maintenance that your vehicle needs might not fit in your schedule or your budget. If you need to spread out your vehicle's service, we'll work with you to develop a maintenance plan which prioritizes the most urgent items. We're your mechanic on Mechanic Street. Lowell's is Lexington's only mechanic on Mechanic Street. While we like to joke that the street was named for Lowell's, it has been called Mechanic Street for nearly 200 years. Records from 1818 (when "mechanic" was a term used to refer to a variety of skilled tradesmen) show Elisha Babcock -- a carriage maker! -- was Mechanic Street's only resident. We like to think that we're doing a pretty good job keeping up Mr. Babcock's legacy! We're in the heart of Lexington. 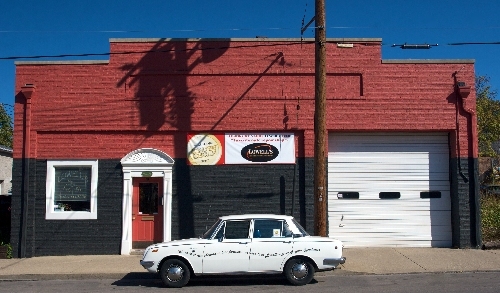 Lowell's is centrally located in downtown Lexington at 111 Mechanic Street. Being in the heart of downtown means that we're very close to some of Lexington's best shopping and dining. We are also within walking distance of most downtown employers. Our convenient location means that you a never far away from wherever you need to go. You can explore great places. We have plenty of places to explore here in Lexington's thriving North Limestone neighborhood. Within one block of Lowell's, you can visit Gratz Park and the Carnegie Center, Columbia's Steakhouse, Doodle's, Third Street Stuff and Coffee, Sayre School, Lexington Beerworks, Lexington Pasta, Mulberry and Lime, Carrick House and Transylvania University. Lowell's is an independent, family-owned business, and we work here every day alongside our great employees. Lowell's is proud to be locally-owned. Locally-owned businesses tend to be more engaged in their communities, and more of the money you spend with local businesses stays here in Lexington. Our knowledgeable and friendly staff can help you understand your vehicle's service. We take pride in thoroughly and clearly explaining how your car works, what might be wrong with it, and how we'll fix it. Our employees have a great deal of automotive experience. What's more, they have a lot of experience working at Lowell's: On average, our employees have worked here for over a decade. Lowell's brings a wealth of experience to fixing your Toyota or Lexus. The best shops constantly refine their skills. Our staff has had a variety of training to help upgrade their skills. This includes Toyota and Lexus factory training, Toyota-specific hybrid training, and training in service and shop management. We're staying ready for the challenges of your vehicle. The National Institute for Automotive Service Excellence (ASE) sets national standards for testing and certifying automotive professionals. We have technicians at Lowell's who are ASE-certified, including one ASE Master Technician. We have the latest Toyota and Lexus technology. Lowell's has the latest Toyota and Lexus service technology, including Toyota's Technical Information System (TIS) and their Techstream software. With Techstream and TIS, we can connect to your car's onboard computer, and get up-to-the-minute diagnostics and service bulletins directly from Toyota. We're engaged in the community. At Lowell's, we feel a responsibility to give back to the community which has enabled our success. So we've supported a variety of charitable causes, including Summerfest, Town Branch Trail, the Carnegie Center, the Bluegrass Chapter of the American Red Cross, and several athletic teams at local schools. We're part of Local First Lexington. We've long been proponent of buying from small, locally-owned businesses. 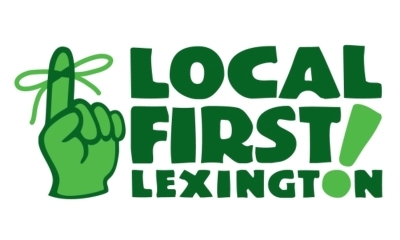 Lowell's is a proud member of Local First Lexington, an alliance of nearly 200 independent, Lexington-owned businesses, aimed at celebrating and promoting buying locally-produced products. We're part of the Automotive Service Association. 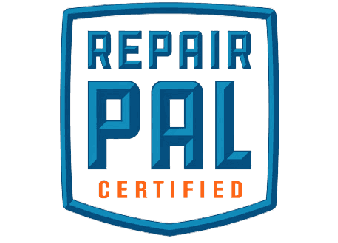 Lowell's is also a proud member of the Automotive Service Association, an association of automotive shops devoted to providing excellent service and repair. We're a AAA Approved Auto Repair shop. Lowell's is a member of the AAA Approved Auto Repair program. AAA has long provided travel services to its customers, and we're pleased to be one of the shops which AAA recommends to them. Lowell's is pleased to maintain an A+ rating from the Better Business Bureau. As a BBB Accredited Business with the Bureau's highest rating, Lowell's has a proven commitment to addressing the concerns of our customers. Our rare 1969 Corona is a wonderful example of Toyota's early success: Although tiny, our Corona still has an automatic transmission and air conditioning - rare qualities in 1969 imports. If we can keep this gem running, you can bet that we can help keep your car on the road. We'll be glad to show you the Corona any time. Just drop by the shop! Lowell's is open Monday through Friday from 7 AM to 6 PM. We try to make it convenient for you to drop off your vehicle before work or school, and still have time to pick it up after a busy day. We are pleased to offer Lowell's Mobile, a phone-friendly version of our website! We've optimized our content for smaller smart phone screens, and made it easier for you to call us directly from our website. You don't need to do anything special. Just visit (or search for) Lowell's from your smart phone, and we'll take care the rest! Since the economy slowed a few years ago, it seems that a lot of businesses have found some 'creative' ways to inflate their prices with a series of unexplained (and inexplicable) charges. These piecemeal charges have found their way into our auto repair industry as well: Document Retention Fees. Shop Supplies Charges. Environmental Disposal Fees. Fuel Surcharges. Some folks magically tack on an additional 15% to your invoice through these questionable fees. At Lowell's, the price we quote is the price you pay. No silly games. No hidden fees. No unpleasant surprises when you pick up your car. We think that's a smarter way to run a business. We hope you do, too. Every customer deserves to understand exactly what we've done while servicing their vehicle at Lowell's. We've redesigned the automotive service invoice to make it clear, open, direct, and easy to understand - Kinda like us! We built it from scratch to make it easier for you to see just what you are getting with every visit to Lowell's. But why care about your mechanic's invoice? Because the invoice tells you a lot about your mechanic, and whether they want you to be informed about your car and their work. Here's what our invoice does for you. You get outstanding service. Our customers say so. Lowell's has earned the Angie's List 2013 Super Service Award for the outstanding things our customers have said about our service. Winners of this award have met strict eligibility requirements, which include an �A� rating in overall grade, recent grade, and review period grade; the company must be in good standing with Angie�s List, have a fully complete profile, pass a background check and abide by Angie�s List operational guidelines. That's what we came up with. Tell us what we missed!